In a generation where technology and innovations continue to make our lives easier, homeowners have begun to adopt innovative designs to increase their home’s functionality. 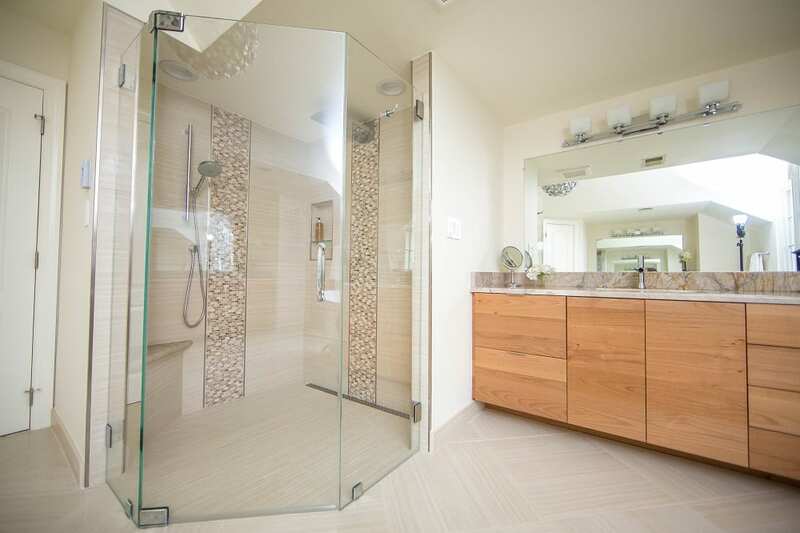 Whether you are preparing for the future or desire a clean, sleek look, a curbless shower (aka level entry shower or barrier free shower) can offer homeowners with a timeless installation. What began as a design to remove a tripping hazard in the bathroom has turned out to be a design that is as aesthetically appealing as it is functional. Historically, thick shower pans needed a curb to hide the increased height of the floor in order to slope the water to the shower drain. Unfortunately, this curb has been a notorious tripping hazard especially for the elderly and disabled. Luckily, a few industrious people saw the need to design a solution that removed this hazard. Fortunately, the solution also created a visually appealing look for the modern bathroom. For more information on some of the fundamental benefits of curbless showers, keep on reading! Curbless shower installation by Collins Tile and Stone, Northern VA. The curbless shower design creates clear visibility and a clean cut look which in essence is more visually appealing. The beauty of this barrier-free design is its chic, continuous-flow and easy-to-clean nature. Therefore, curbless showers offer homeowners with less maintenance and time spent cleaning. Curbless showers offer a continuous, barrier-free look which can open up your entire bathroom’s design and make your room look larger. With better visibility, your shower features a luxurious-look that homeowners and guests alike will love. You can provide a safer atmosphere for yourself and aging and disabled family members through the use of curbless showers. Safety can be a concern from young kids to aging parents, and it is essential to find a bathroom design that is functional and safe for all ages. With a curbless design, your mind can be put at ease because it removes a potential tripping hazard. 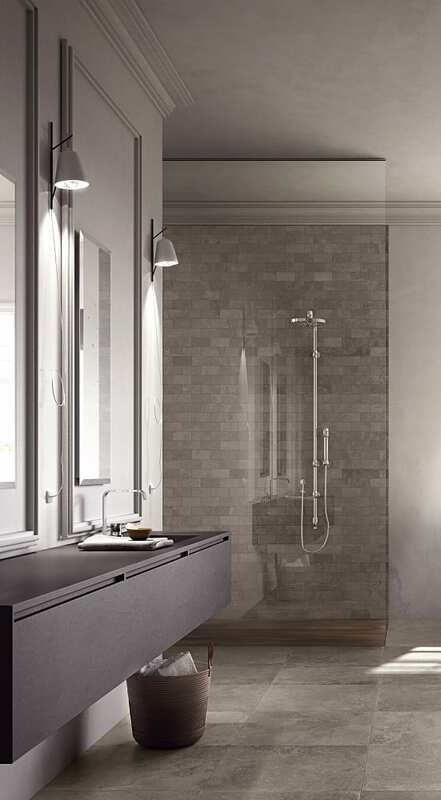 If you are looking to grow in your space and “age in place,” curbless showers offer greater accessibility and mobility than a standard curb shower. Because a curbless shower is ideal for all ages and disabled individuals, your home becomes marketable to a larger group of potential buyers when selling your home. By upgrading your shower, you can provide a chic, timeless look while investing in your future. Not only is the design seamless and beautiful but it helps assure homeowners of a safe future and ease of use. What’s Needed to Create a Curbless Shower? 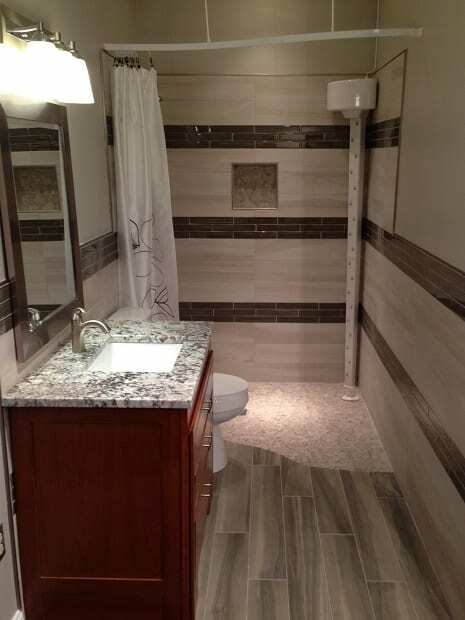 To accomplish this stylish, functional look, it is all about the waterproof shower pan (aka shower tray), and Conestoga Tile offers several which we outline below. A common benefit of each of these design options is that they avoid expensive floor joist modifications. To dig deeper, we looked at the important benefits featured by a couple of our curbless shower tray vendors. Let’s take a look! ARC ShuffleDEK®, TrueDEK® Classic and TrueDEK® Linear shower bases are composed of an extremely strong glass reinforced plastic that sits on the floor joist giving the shower base the ability to sit flush with the sub-floor. The bases are pre-pitched towards the drain and ready for tile or stone installation. ShuffleDek and TrueDek shower foundations install flush with the subfloor avoiding any need to install a ramp or other subfloor modification. The TrueDek linear base design allows for multiple drain placement options in essence, increasing the application and shower design layout options for homeowners. 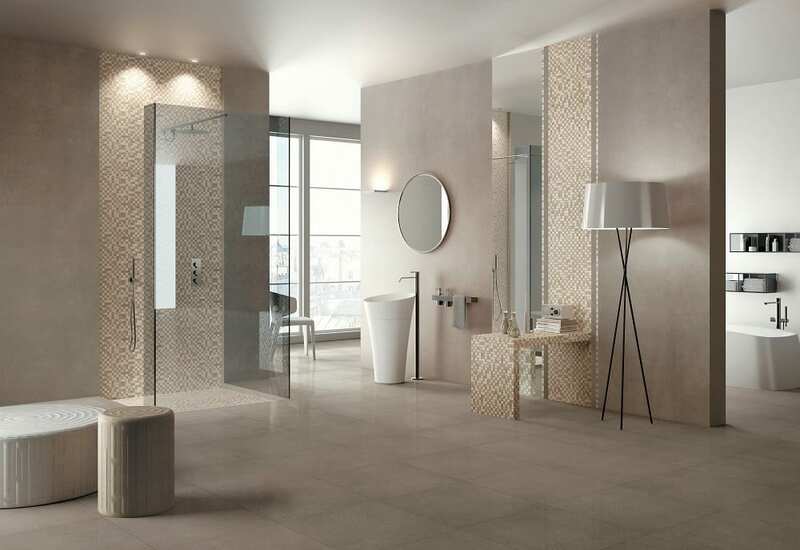 TrueDek Classic bases can be cut into different sizes and shapes to provide consumers with a truly unique and creative shower design. Both TrueDEK and ShuffleDEK provide a structural shower foundation with a lifetime warranty. 7/8” thick at the edges for a thin application. Installed on 2x wood joists, truss joists, and TJI joists. A flat rim for easier leveling. Supports 860 lbs. on joists and typical blocking; up to 1,100 pounds with complete blocking underneath. Laticrete® Hydro-Ban pre-formed shower products (which include trays, drains, niches, benches and accessories) are ideal for achieving a curbless shower system. Be sure complete the system with the use of Laticrete® installation products for one of the industry’s most comprehensive system warranties. Curbless shower installation options are available. Pre-sloped ready to tile pan eliminates the need for traditional mud bed installations. Pans can be incorporated with Laticrete’s complete shower system which reduces the risk of water and vapor penetration. The pans are lightweight and durable and easy to transport and handle during installation. It can quickly and easily be modified to your shower’s size on site. Works in conjunction with Laticrete tile and stone installation materials. Schluter’s® Shower System is an integrated family of products that together form a fully bonded, watertight assembly for tiled showers. With the use of their prefabricated shower trays, drains and shower ramp, a curbless shower can be easily achieved. The trays are a component of Schluter’s complete shower system which reduces the risk of failures due to water and vapor penetration. Lightweight, durable, easy to transport and hand handle during installation. They can quickly and easily be modified to the size of your shower on site. If you are interested in learning more about Conestoga Tile’s selection or need help in choosing the right fit for your home, please do not hesitate to call us or visit a location near you to speak with a pro in our showroom or at our contractor desk. We look forward to the opportunity to work with you.